Visiting Roman Ruins In Jerash - Riot, Riot! We left tried to leave Amman early for Jerash. Our rental car didn’t arrive (yes, that’s right – Hotel delivery is a thing!) until 2 hours later. Jordan time. And that was fine – we spent the morning securing a traditional head scarf and salted pistachios at the local market. Driving out of Amman was a small challenge – traffic follows its own rules. Forget about signaling, stopping and lights. On the other hand everyone is very courteous and once you get the hang of it it’s actually quite fun! Closing in on Jerash you can see Hadrian’s arch from afar. The Roman ruins of Jerash are huge and walking amongst them will take you a good 3 hours. Spectacular views are all around and you can’t help but marvel at the labor that went into erecting this city. The ‘Pompei of Asia’ – as the ruins are often called – is super impressive! As often is the case in less developed places, you can wander freely wherever you like and climb the ruins. So sitting in the old amphitheater transports you back in time. The grand road – the Cardo Maximus – runs throughout the entire city and you can still see the tracks left by thousands of chariots riding through. Usually, according to the Lonely Planet, there is a not-to-be-missed Roman play on twice a day that brings the city back to life. However, we ran into a political festivity held on the main square. Complete, with traditional costumes, dance and music. 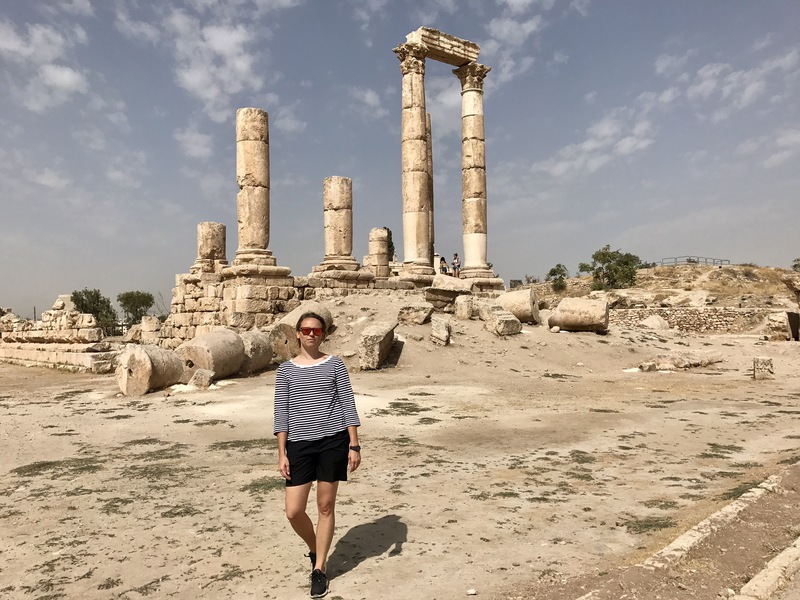 The visit left us starved – so we walked down the road to Amman for about half a kilometer to dine at the Lebanese House. It’s famous all over Jordan – and rightfully so. The setting on the roof terrace is superb, the service exquisite and the food plentiful and delicious. Prices compare to the Western world, but absolutely justified. Great day to turn 34! Read about day 1 in Amman here!